Sometimes, the plan in question is your health insurance, especially when life doesn’t happen conveniently within the Annual Enrollment Period (AEP) window. When life happens, how do you know whether those changes will affect your individual Affordable Care Act (ACA) insurance coverage? And if they will, how do you report them and make the necessary adjustments? Do you know which changes should be reported to the government instead of to your insurance company? Each year, many of our ACA customers face these questions. Here’s a cheat sheet of why these changes matter, which changes to report and how to report them. Note that the following applies to individuals under the age of 65 seeking coverage. If you buy health insurance through the federal Health Insurance Marketplace via Healthcare.gov, then changes like an increase or decrease in household income, a change in marital status, the arrival of a baby, or a new health coverage offering through your job can affect your subsidy eligibility and premium cost. Changing your address may affect which plans are available to you and your premium cost, regardless of where you purchased your health insurance plan. Some changes may affect the subsidy amount and/or coverage options available to you. Reporting these changes as they happen will help ensure that your information is up to date when it’s time to re-enroll. Certain changes may qualify you for a Special Enrollment Period, allowing you to change plans outside the Annual Enrollment Period. It’s essential to report any of the changes listed below to the Health Insurance Marketplace as soon as possible after they occur. What’s also essential is who you notify. 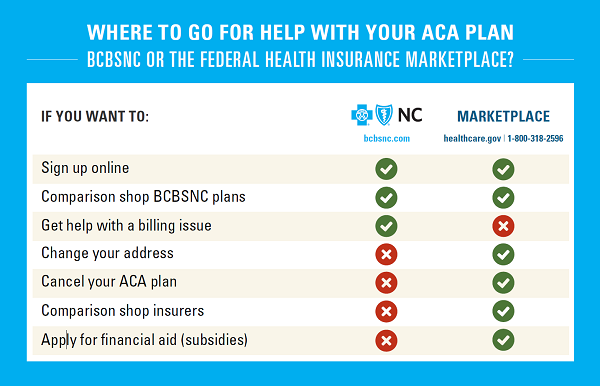 If you enrolled in a BCBSNC plan through the Health Insurance Marketplace, the following changes must be reported directly to the Health Insurance Marketplace, not to BCBSNC. According to Marketplace rules, insurers can’t make these changes for you. The Health Insurance Marketplace offers a tool from the IRS that can help you estimate how something like a change in income or family size might impact your subsidy eligibility or amount. Note: Here’s what to do if you move out of state. Correction to name, date of birth or Social Security number. Online by following these step-by-step instructions. By phone, 24/7, at 800-318-2596. In-person with help from one of the more than 200 trained and certified ACA navigators in North Carolina. You can find assistance near you at https://localhelp.healthcare.gov. Changes cannot be submitted to the Health Insurance Marketplace by mail. Contact the person in charge of benefits at your employer and ask for an Enrollment and Change Application. Contact BCBSNC Customer Service at the number on the back of your member ID card. Visit https://www.bcbsnc.com/members/public/ and sign into your Blue Connect account. With Blue Connect, you can update your policy’s contact information if your home address, phone number or email address changes. Contact your licensed BCBSNC agent to make changes to your plan information. When something like a marriage, the birth of child or a job change happens, your health insurance plan is probably the last thing on your mind. However, informing the Health Insurance Marketplace or BCBSNC of these changes in a timely fashion is important to ensure you have a smooth re-enrollment and keep your coverage up to date.